links to order all three of my books (Whipping Girl, Excluded, and Outspoken) online, including the (fairly) recently released Whipping Girl audio book! note: I also include links for independent bookstore options, if that's a cause you want to support! 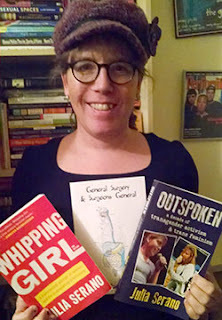 for my latest book Outspoken: A Decade of Transgender Activism and Trans Feminism (which was self-published on my own Switch Hitter Press), I include tips on where to best (i.e., least expensively) buy copies. as a special offer only on my website, you can buy signed copies out Outspoken, made out to you, or whomever you wish! (btw, I normally ship them by USPS Media Mail, which usually takes about a week to arrive, so you should act fast if your goal is to have it before December 25th). if you enjoy my music (my bands Bitesize and *soft vowel sounds*), you'll find links to order digital copies there, plus PayPal buttons to purchase compact discs (if you happen to be old school). Once again, here's the "buy stuff" link. Happy shopping!